Hello my lovely readers, hope your August is off to a splendid start. I am heading for a trip home to Alaska on Friday but I wanted to make sure and share with you this fantastic entrée. Perhaps, like me, you’re a bit sugared-out after five straight weeks of ice cream and are looking to “detox” with something sans sugar completely. Well, look no further! A couple of weeks ago I saw a recipe for lasagna zucchini boats on Pinterest, which I thought sounded delicious but also like way too much work. If you’re new here, I am pretty lazy when it comes to making things that don’t qualify as dessert or occasionally breakfast. In any case, I liked the idea of a zucchini base but otherwise similar to my stuffed peppers that I have made previously. I threw together some filling and filled up my zucchini, topping them with cheese of course, and ended up with a pretty fabulous meal. 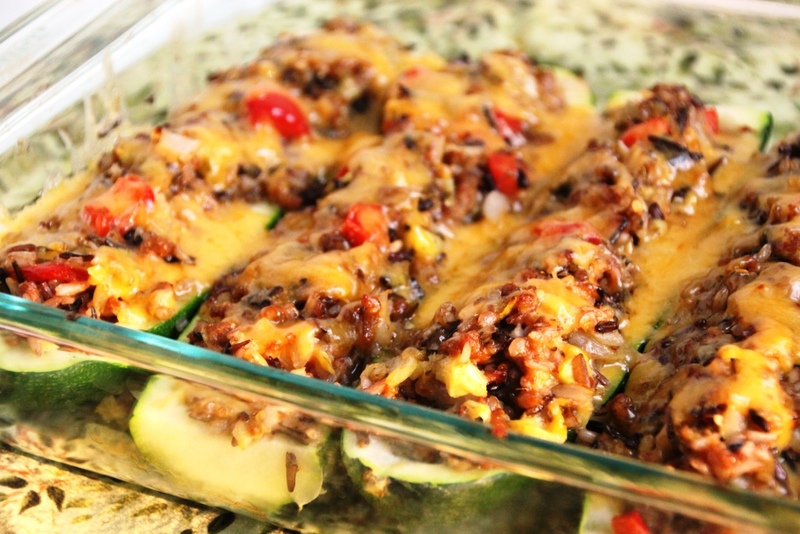 Wild rice, onion, peppers, zucchini, Italian sausage and various spices come together in a lovely blend, complemented perfectly by a zucchini base. The filling is cooked beforehand, so baking them is mainly to soften the zucchini and melt the cheese, if you add it. This recipe is superbly easy to tailor, so you can pump up the heat with more red pepper flakes, or go a completely different route depending on what you have in your cupboard. It also has the pleasant attribute of being able to taste the filling before you finish up the entrée, so you can play with the flavors as you make them. Furthermore, you can easily make them vegetarian by leaving out the meat, and vegan by also ditching the cheese. If you’re a mushroom person (gross), they would also go well in addition to or in lieu of the sausage. And, of course, any other ground meat could be substituted just fine, although you may want to add some additional spices. They also reheat splendidly in the microwave, so it makes for great leftovers if you don’t eat them all the first night, so go buy some zucchini and make these for dinner. Cook rice according to directions, set aside. 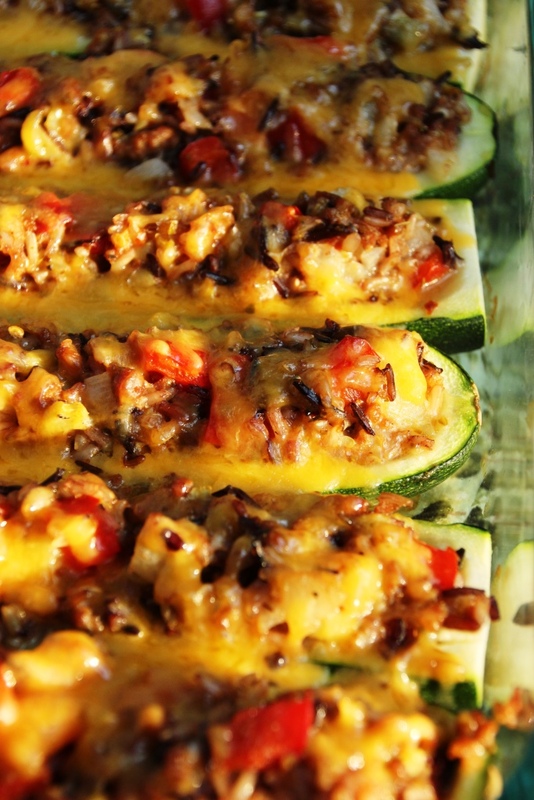 Trim zucchini to fit in a 9×13″ baking dish (if necessary), then cut lengthwise in half. Hollow out the inside leaving about 1/4″ of zucchini as an edge. (An ice cream scoop works well for this.) 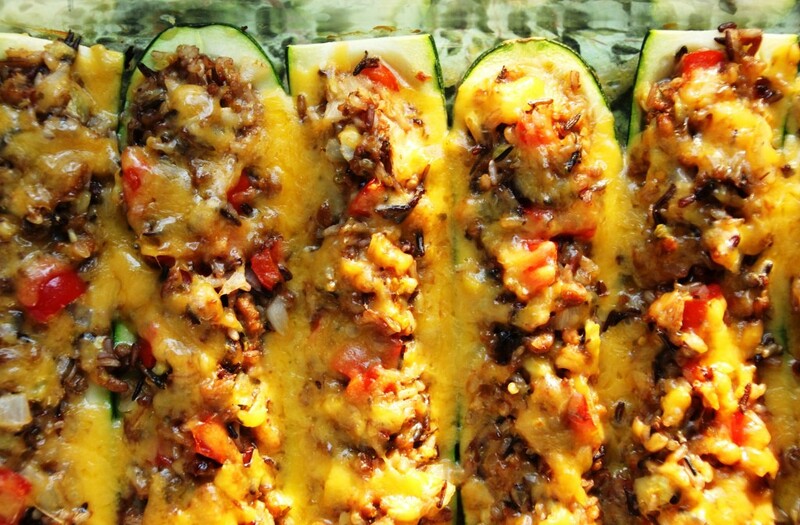 Place zucchini in the baking dish and set aside. Dice zucchini guts, set aside. In a large frying pan or wok, cook sausage over medium heat until almost done. Add diced zucchini, bell pepper and onion, and cook an additional few minutes or until the veggies are warmed and a bit softened. Add spices and stir to combine. In a large bowl, combine cooked rice and veggies. Top with grated cheese, if desired, and bake for an addition 3-5 minutes until the cheese is melted, then serve hot. 1 I had about 2 cups of filling left over. It is great reheated in a tortilla like a burrito, or on its own. Or use it to stuff a couple additional bell peppers. Welcome! I don’t have a ton of vegan recipes but I try to point out the easily modifiable ones when I can. Great to have you!